know the old adage about people in glass houses not throwing stones. But would the same rule apply to a Lucite house? For just as transparent a look with much more durability and strength, the “cousin of glass” is reemerging on the design scene in everything from lamps to seating. Lucite first hit the interior design world in the late 1960s. Expensive but popular, “it was quite prized in the very modern kinds of homes,” says Phoenix interior designer Dorothy Bron of Bron Design Group. There were Lucite dining room sets, console tables, even love seats. The draw, says Dorothy’s partner and fellow designer Eric Bron, was its tricky ability to make a room seem larger by making the furniture almost invisible. “It would seem like less furniture in a room because you could see through it,” he says. As with all things popular, knockoffs followed. Similar pieces were made with a cheaper form of plastic and sold for less. Without the glassy shine Lucite had, these second-rate pieces looked as cheap as they cost and, says Bron, the trend faded. “Not all acrylics are created equal,” he says. That’s why, with the trend of translucent furnishings on the upswing, manufacturers are choosing to go with a nearly identical-to-glass acrylic that’s more affordable than the old Lucite and more stylish than opaque plastic. The result is a modern take on an old design. “The acrylic used now is a polycarbonate, which is tougher for more wear and tear,” says interior designer Davinder Chawla of Robb & Stucky in Phoenix. And the look of a few acrylic accents placed in a modern setting gives a room an instantly stylish update. 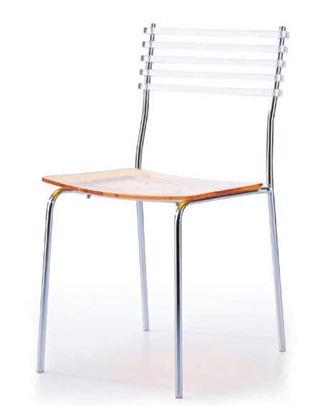 “When you have a chair completely made of Lucite, it disappears,” says Chawla. “It goes back to that very important design concept— less is more.” To some, a $900 chair essentially made of plastic seems a bit extreme, but Chawla says the price doesn’t so much reflect the material as it does the shape and color. “It’s considered more of an art piece,” says Chawla. Marcel Fouz, owner of Scottsdale’s 2b Mod store, says though acrylic furniture might appear modern, they’re actually collector’s items. 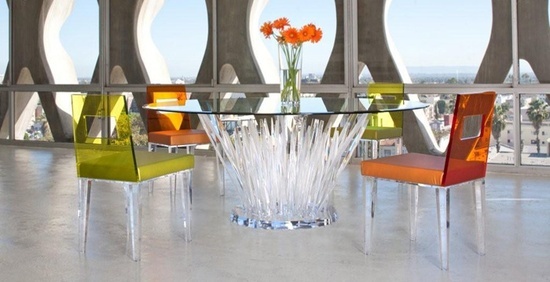 High-quality acrylic furniture inspired by ’60s Lucite designs is rare nowadays.